The weekend has just passed but I'm already looking forward to the next one. I've slowly been gathering furnishings and essentials for the new cottage and it will feel good to finally get them in place next weekend. 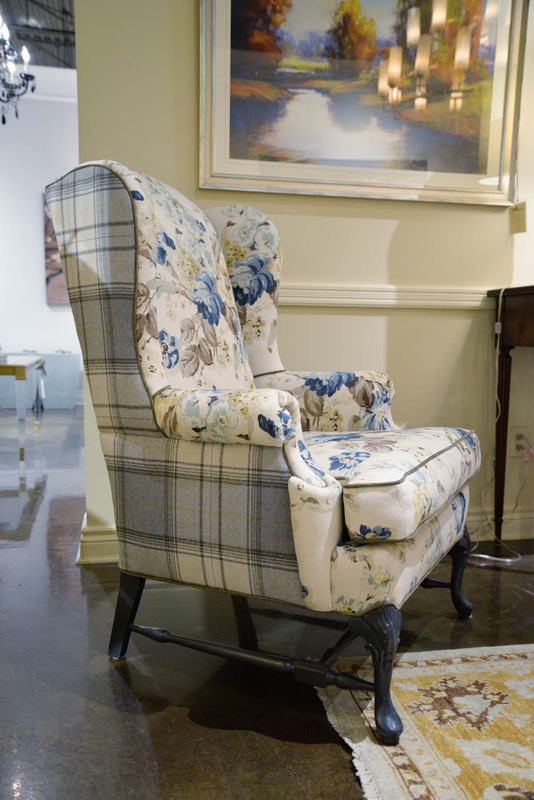 The custom buffalo plaid Barrymore chair has been made and I'm excited to get it into it's new home. As I mentioned a few posts back, I'm new to the custom furniture process. Some of you might be as well so I thought I'd share what I experienced. 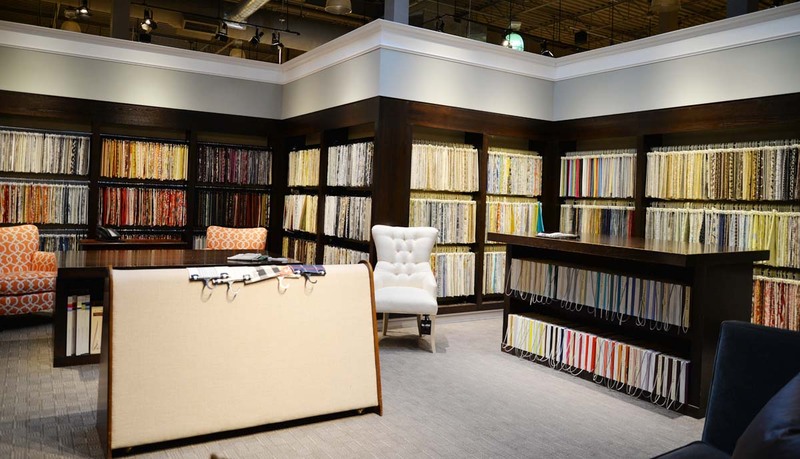 Custom furniture can be quite an investment and lots of retailers claim they produce a quality product, but what does that even mean? What are the hallmarks to look for? 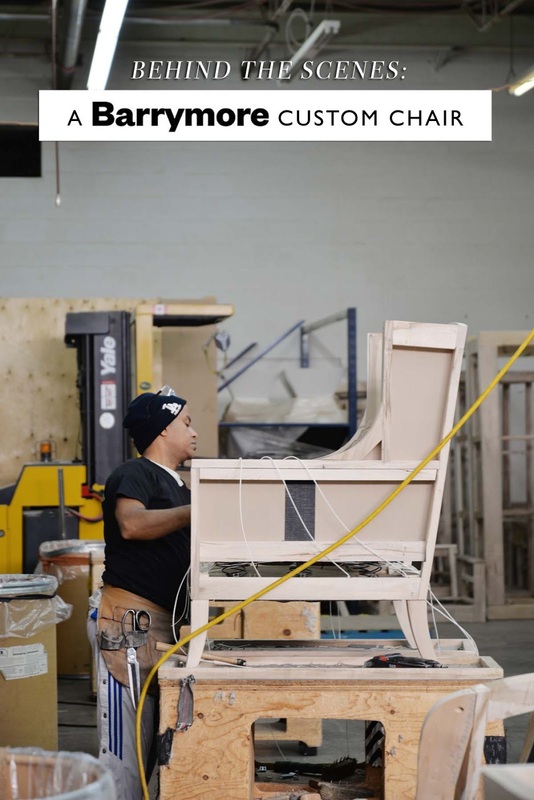 Barrymore Furniture kindly let me have a behind the scenes look at their manufacturing process and there's so many interesting things I want to share with you. My first step in the process was selecting the chair. This meant walking around the Barrymore showroom and sitting in too many chairs to count. I'm a huge online shopper but when it comes to a chair or sofa, that's something I need to see and feel and sit in before I buy it. The first thing I was looking for was the style of the chair. Did I want a low back or high back? Exposed feet or covered? A swivel base? Rolled English arms or sleek square arms? Now here's where things got tricky because even though there were 200 styles of chairs and sofas to choose from, any of these models could be further customized. 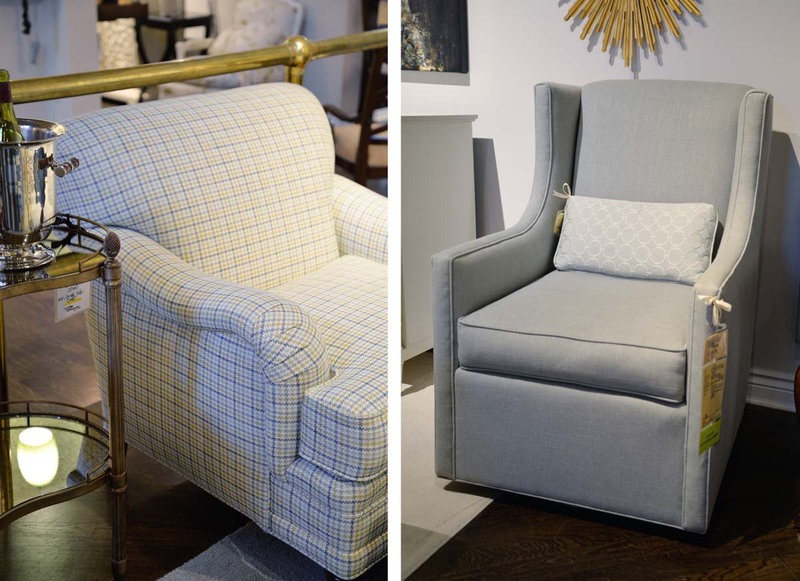 From the firmness of the seat cushion to the style and colour of the leg, to adding nail head trim or a valance or casters, there were dozens of custom options to consider. I ended up choosing the Carlton Wing Chair. I loved the modern lines of this wing back chair. It feels fresh yet traditional. It's dramatic and eye catching and I thought it would showcase the fabric beautifully. I already had my sights set on the buffalo plaid but it was worth perusing the thousands of fabric options at Barrymore and seeing what else I should consider. Plaids and stripes, I love you so much. 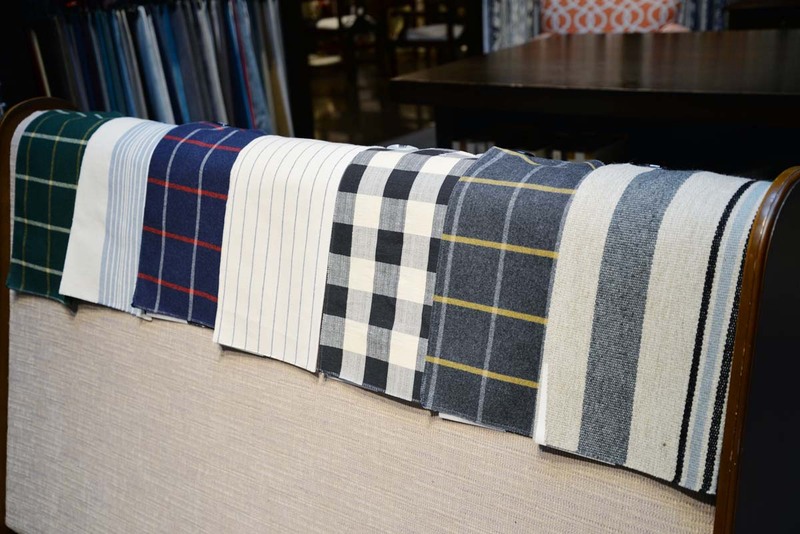 Aside from the buffalo plaid, I really loved the French stripe (2nd from left) and the multi-stripe (furthest right). They had a casual beachy quality that could work at the cottage. I also briefly considered a floral pattern. 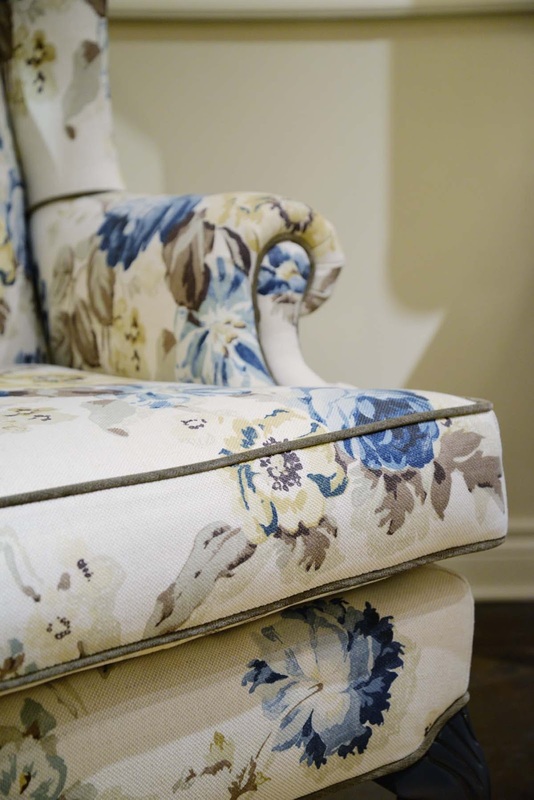 See how perfectly the floral pattern is matched on the top and sides of this seat cushion? That is a mark of true craftsmanship and it doesn't happen by accident. It all starts with the cutting of the fabric. 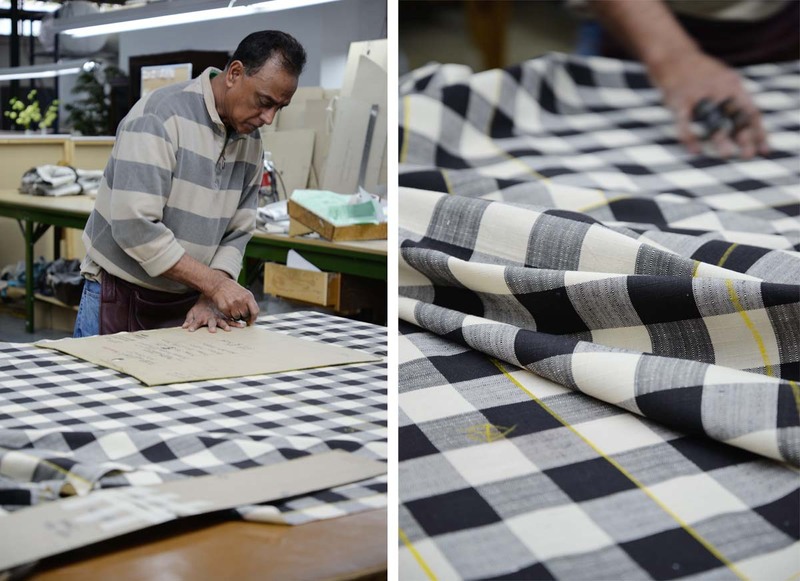 Templates are laid out and each fabric piece is cut by hand. No computerized layouts here. It takes real skill to lay out the templates and and see in your mind's eye how all the pieces will fit together - before a single cut is made. 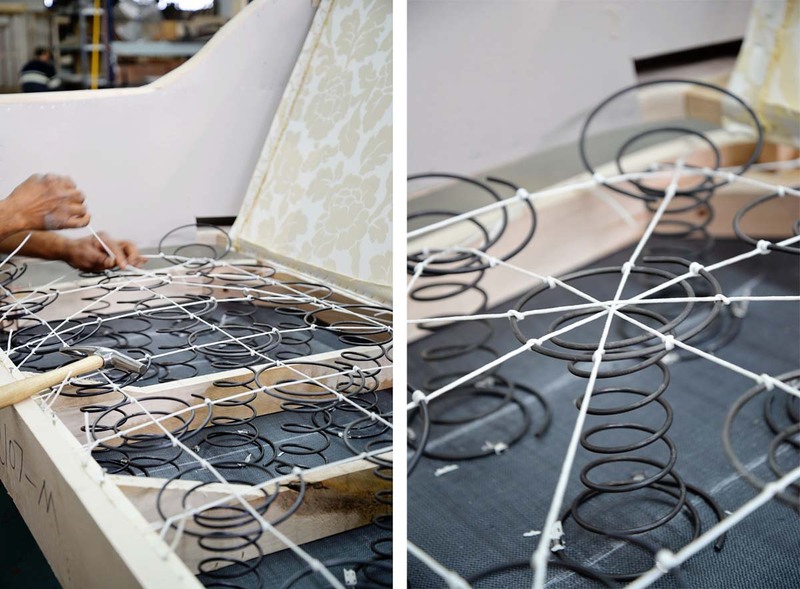 Ensuring that a stripe is centred down the back of a chair or that a floral is matched perfectly across a seam... all of those important calculations are made right here. Once the fabric is cut, it moves on to be sewn. One thing I noticed at Barrymore is that they use a truly handmade process. One person does the cutting. Then another one does all the sewing. One more does the web and coil, and then someone else does the upholstery. 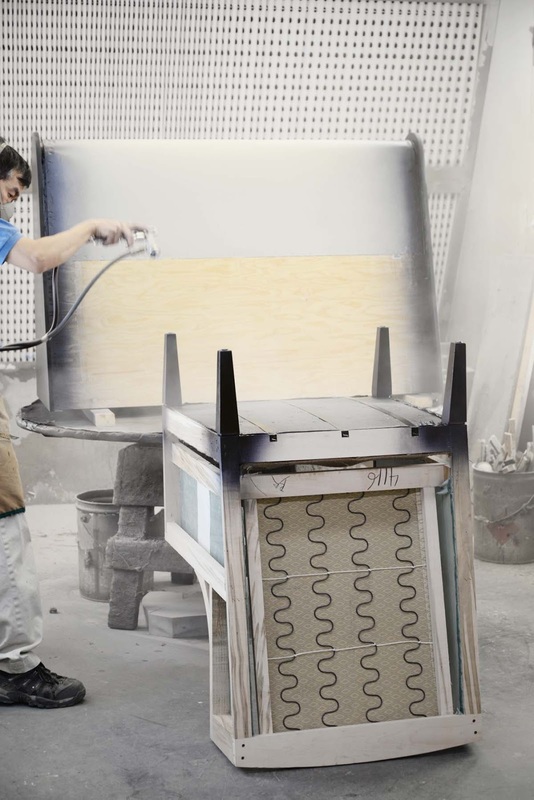 A number of skilled hands are needed to bring a single product to life. 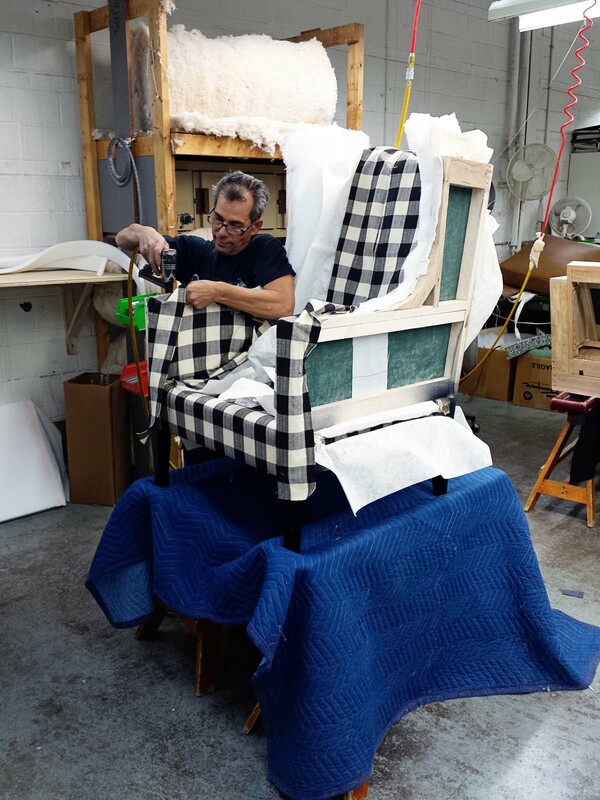 Since 1919, every Barrymore chair and sofa has been handmade right here in Toronto. 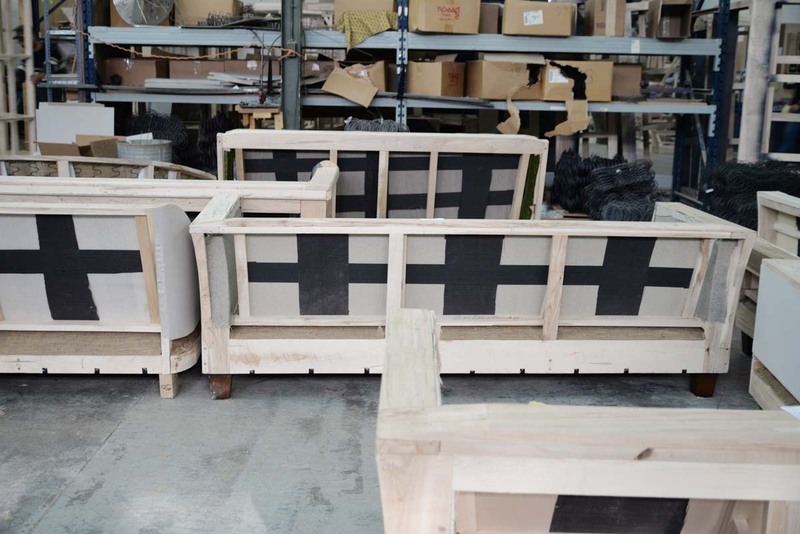 All of these chairs and sofas start with a 100% Canadian kiln-dried hardwood frame. Eight-way hand tied coils are attached to the frame. If that sounds time and labour intensive, it's because it is! One sofa takes about two hours to complete this stage. But this method is the gold standard in upholstery and produces a comfortable product that is heirloom quality and will last generations. It surprised me to see how clean and neat the product looked at this stage. If you look closely, you'll see that scrap materials were used to line the frame. There seemed to be little wastage or excess on the factory floor or in the products themselves. In fact, there seemed to be a lot missing... no big heavy machinery, no hoists to move products through in quick assembly line fashion... it was all being done by people, methodically and skilfully. I found this part of the tour the most fascinating. When you think of a foam cushion, you probably think of a block of foam wrapped with some sort of batting. 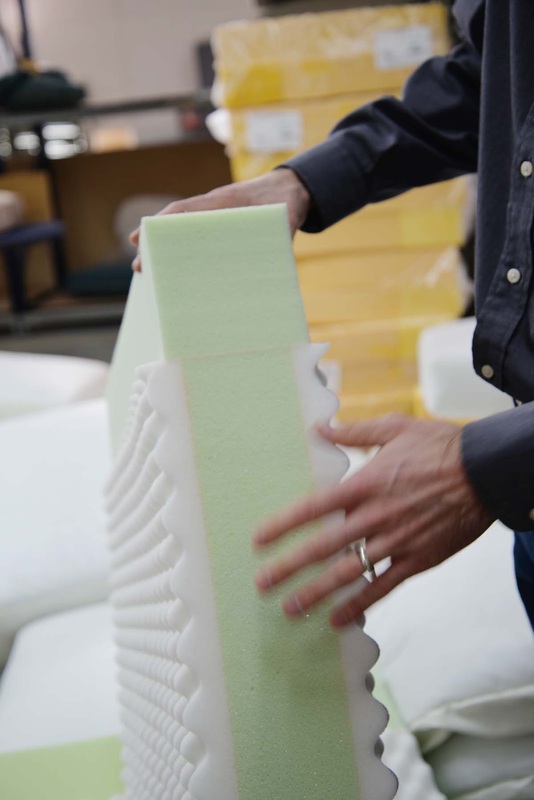 I was surprised to see the level of construction that goes into a single cushion: the inner core and front edge consist of high-density foam which is then sandwiched between two layers of convolute foam. The convolute foam provides cushion and air flow while the high-density foam provides resilience and support right where you want it most, at the front edge of . So smart! 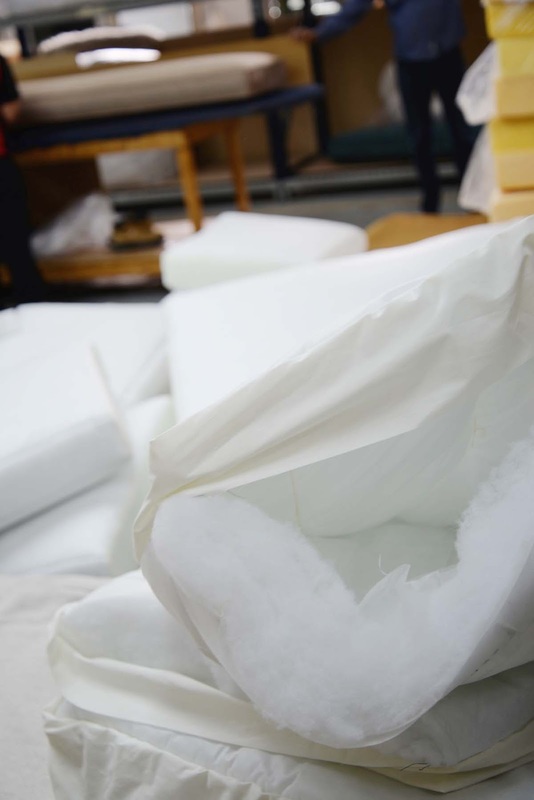 The foam is then wrapped in a thick two-sided duvet for ultimate comfort. Finally, the last stage is the upholstery. I imagine that this manufacturing process has changed very little at Barrymore over the last hundred years. 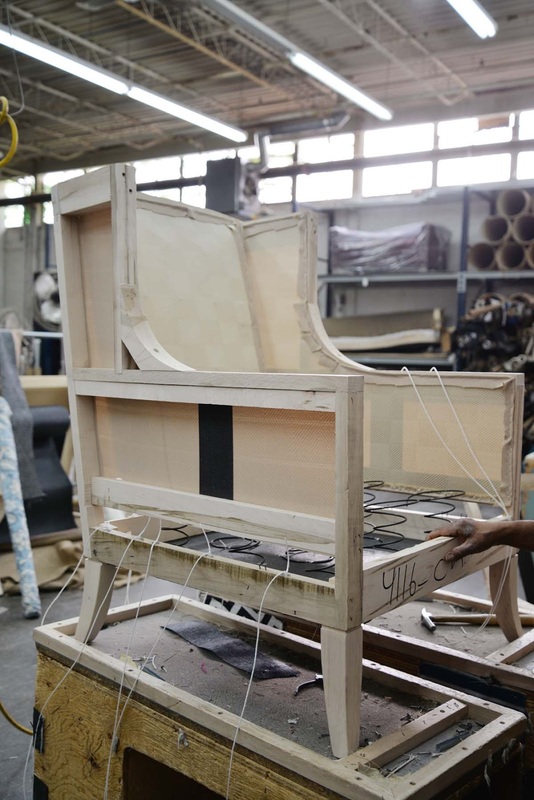 By the end of the tour, I got a better understanding of everything that goes into a custom piece of furniture: it's quality materials at each stage, an attention to detail, and skilled craftsmanship done by hand. And here is a photo of my chair getting upholstered! So exciting! The chair is all finished now and I can't wait to show it to you.